Elizabeth Ann Seton, founder of the Sisters of Charity, dedicated her life to teaching. Born in New York in 1774 to parents whose friends included George Washington and Alexander Hamilton, Elizabeth Ann Seton and her five children moved to Baltimore after the death of her beloved husband, William. Shortly thereafter, she took her vows and received the title, Mother. Her community became known as the Sisters of Charity of St. Joseph. In 1810 Mother Seton established a free school in Emmitsburg, Maryland. She went on to establish schools and orphanages along the East Coast. 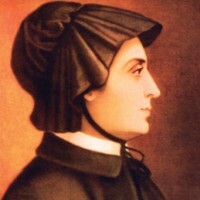 Today, Mother Seton is widely regarded by many as the founder of the American Catholic school network. Elizabeth Seton died in 1821 at the age of 46. Her legacy lives on not only through her 30,000 spiritual daughters serving throughout the world, but also through the administrators and faculty who continue to serve students. The year 2000 marked the 25th anniversary of the Sainthood of Mother Seton. The Seton Hill College Alumnae Corporation created the Elizabeth Seton Award in 1959 to commemorate the life of Elizabeth Ann Bayley Seton, founder of the Sisters of Charity. The designation of a contemporary woman whose life achievements paralleled, in some way, that of Elizabeth Seton, would emphasize the relevance of her life in today's ever-changing world. The Elizabeth Seton Medal is of bronze, the design of sculptor Carl C. Mose. The obverse bears the likeness of Elizabeth Seton inspired by an early portrait. On the reverse is engraved the motto of the Sisters of Charity of Seton Hill, "Caritas Christi Urget Nos," and beneath it, the arms of the College.